Earlier this week I was in NYC to witness the auction of a portion of a collection I helped inventory about two years ago. The collection was pieced together by Maury Bromsen, a rare book collector based in Boston, who passed away in 2005, bequeathing the entire collection to the John Carter Brown Library (JCB) in Providence Rhode Island. The Bromsen collection originally included material by and about Simon Bolivar, which had already been donated to the JCB, along with material mostly, but not exclusively, from the 18th, 19th and 20th century spanning the length and width of Latin America. Among the material I inventoried were original proclamations of the Mexican independence, along with entire collection by Andres Bello. There was also material on tourism, politics, novels, memoirs, cookbook, and all kinds of other literary pieces emerging from the region. The auction, which took place at Swann Auction Galleries, included 68 lots from the original Bromsen collection, all of which were sold in about an hour. This sale was set up as a shelf sale, meaning that everything had to sell, regardless of the price; this would be in contrast to a catalog sale where the seller set a minimum price, and items will be kept if there are no buyers willing to pay this price. Buyers in this occasion were mainly book dealers who had to buy entire book lots to get a few hidden gems, which they would later resell individually. Someone else that was there buying and whom I got to meet was the director of the Biblioteca Luis Angel Arango, in Bogotá, Colombia. 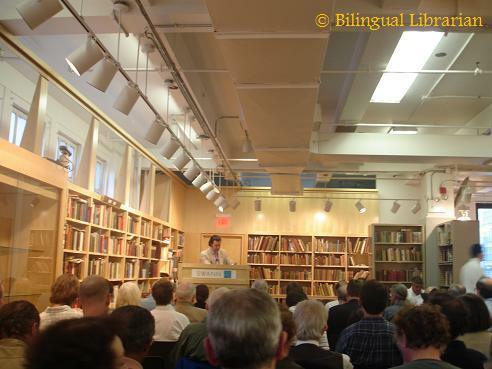 The fact that she came all the way from Colombia to buy books on Latin America in New York was very telling of how the flow of books works these days. There are still thousands of book from the Bromsen collection that will be auction off sometime in the future. The next sale will likely be middle prices material, and the last one will be for all the remaining treasures.